The western US was in the midst of a record heat wave Friday, with one dead in California as massive fires forced hundreds to evacuate. In this file photo taken on July 1, 2018, firefighters scramble to control flames surrounding a fire truck as the Pawnee fire jumps across highway 20 near Clearlake Oaks, California. 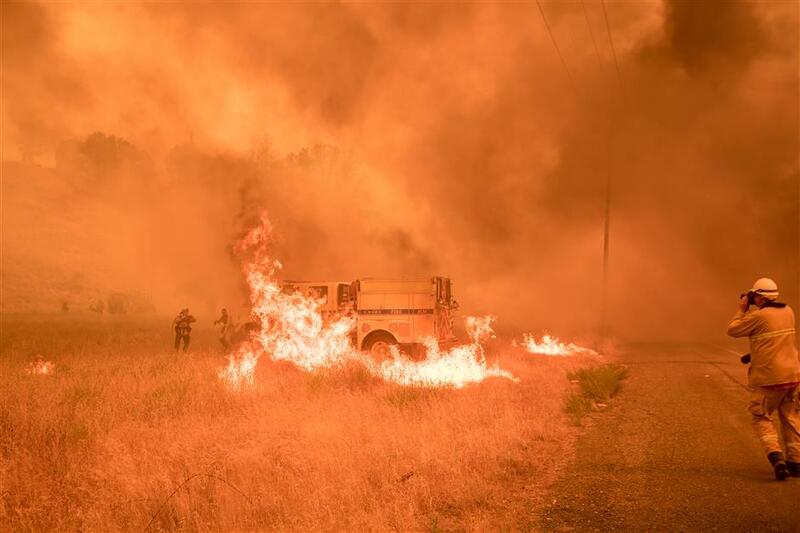 "Large fire activity is spread across the country from Florida to Alaska," the National Interagency Fire Center announced, as temperatures spiked above 104 degrees Fahrenheit (40 degrees Celsius) in some places. "Currently 60 large fires have burned more than 823,000 acres in 13 states," the center added. Twenty fires burned in Alaska, with seven others in New Mexico, four in California, eight in Colorado and others in Nevada, Arizona, and elsewhere in the southern US. California's fire agency, Cal Fire, said on Twitter that one person had died as a result of the "Klamathon" fire in Siskiyou County, near the border with Oregon. Mandatory evacuations were in place, including in the Napa Valley wine region and in southern California near San Diego, where state Governor Jerry Brown declared a state of emergency Friday night due to the "West Fire." That fire has already destroyed homes and forced road closures, the governor's statement said. Authorities' efforts to tackle the fires have been complicated by record-breaking hot weather, with temperatures reaching 113 degrees Fahrenheit in Palm Springs -- two hours east of Los Angeles -- and 111 degrees Fahrenheit in Phoenix, Arizona.